This week the White House did something it rarely does - issue an apology. 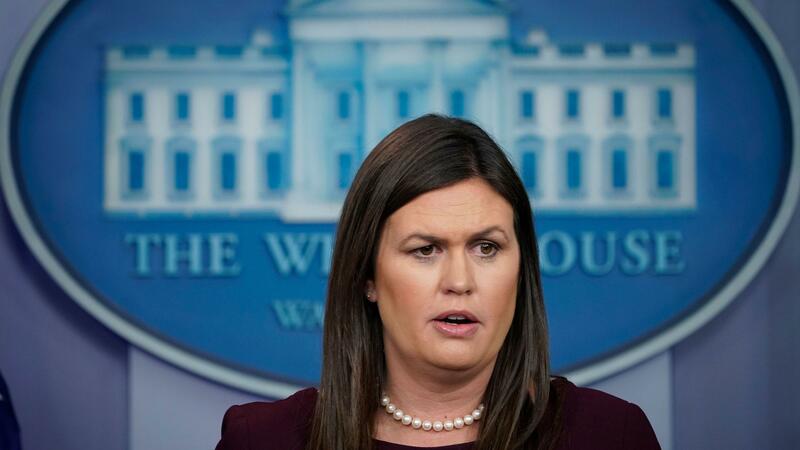 Press secretary Sarah Sanders apologized after she wildly understated job gains by African-Americans under former President Obama. President Trump often boasts that unemployment among African-Americans has fallen to a record low on his watch. NPR's Scott Horsley reports that's merely continuing a trend that began under Trump's predecessor. SCOTT HORSLEY, BYLINE: Cable television has been filled this week with news of Omarosa Manigault Newman, the former reality TV star and presidential assistant who's in the midst of a publicity tour for her new tell-all book. Manigault Newman, who first gained notoriety on "The Apprentice" with Donald Trump, has accused the president of being a racist. Press secretary Sarah Sanders tried to rebut that charge on Tuesday by pointing to economic gains that blacks have enjoyed on Trump's watch. SARAH HUCKABEE SANDERS: This president, since he took office, in the year and a half that he's been here has created 700,000 new jobs for African-Americans. That's 700,000 African-Americans that are working now that weren't working when this president took place. HORSLEY: Let's set aside the fact that Trump himself has not actually created all those jobs. So far, at least Sanders' numbers are on the money. The Labor Department says just over 700,000 African-Americans have found work since Trump took office. The trouble began with what Sanders said next when she tried to benchmark Trump's jobs record against that of his predecessor, Barack Obama. SANDERS: When President Obama left after eight years in office - eight years in office - he had only created 195,000 jobs for African-Americans. President Trump in his first year and a half has already tripled what President Obama did in eight years. HORSLEY: In fact, there were 2.9 million more African-Americans working when Obama left office last year than when he was sworn in. Sanders' figure, 195,000, was off by a factor of 15. After reporters pointed out her error, the press secretary issued a rare correction on Twitter last night, and the White House Council of Economic Advisers apologized for what it called a miscommunication. It's a pattern that's familiar, though, to anyone who remembers the presidential campaign when Trump often exaggerated the ills facing black Americans. PRESIDENT DONALD TRUMP: You're living in poverty. Your schools are no good. You have no jobs. Fifty-eight percent of your youth is unemployed. What the hell do you have to lose? HORSLEY: The fact is job gains among African-Americans in the 18 months since Trump took office look very much like the gains in the 18 months before he was sworn in, albeit a little slower. And the same is true for job growth overall. U.S. employers have added 3.4 million jobs since Trump became president, just shy of the 3.7 million added in the last year and a half of the Obama administration. Janelle Jones, who's with the left-leaning Economic Policy Institute, says there has been no sharp uptick nor downturn on Trump's watch, just a smooth and steady line. JANELLE JONES: He has inherited an economy that was on its way. During Obama's presidency, we were going through a recovery. It was really starting to reach communities that are usually left behind. I'm thinking of workers of color. And so what we've seen since Trump has been in office is exactly that - a continuation of this trend. HORSLEY: And no matter how much this president tries to reverse and discredit the legacy of his predecessor, the numbers are plain to see in black and white. Scott Horsley, NPR News, the White House. Transcript provided by NPR, Copyright NPR.